Willem van Eeuwen married Corrie van der Voorden early 1942. She was a beautiful, almost exotic lady with a sweet and soft character, who unfortunately died at a rather young age. As a famous Dutch writer once wrote: 'Anything of value is defenceless'. My aunt Cornelia (Corry) van der Voorden - second from left, first row - was at that time a secretary to the director Anthony Veder who founded and owned the Dutch shipping company later named Oranje Line just before the war. A merry picture but thick clouds were gathering to the east of Holland and would effect us all in a week's time. In this picture my aunt is the second to the left of the front row next to Anthony Veder. The occasion was the christening by Mrs. Veder (with flowers) on May 3, 1940 of the vessel 'Prins Willem IV' built by the yard 'de Merwede' at Neder-Hardinxveld. About a week later the Germans invaded our country and the occupying forces 'borrowed' the ship later that year. See full story below. Cornelis Verolme (see arrow) was also present. He later founded the Verolme Dock and Shipyard Company, which became one of the biggest yards in Holland in rather a short time. Anthony Veder (born in Rotterdam October 7th, 1914 and died also in Rotterdam Augustus 30th, 1967) was the son of Anthony Veder, a prominent business man and radio pioneer and Maria Johanna van Hoboken. The Hoboken's were at that time a very wealthy and leading family in the city of Rotterdam. Although backed by family capital from his mother's side his ambitions at his young age were considerable and quite unusual for those days. He died at a relatively young age due to a heart condition. 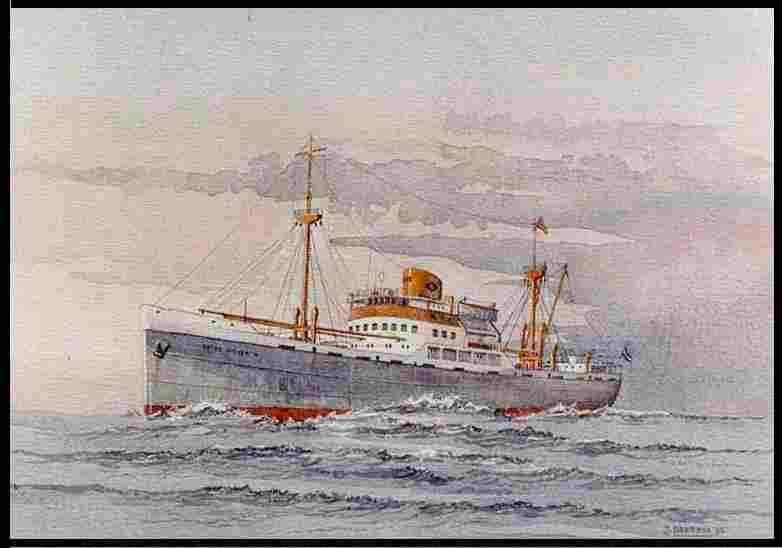 The ms "Prins Willem IV"
From an original water-colour by ©Hans Breeman. Owners: Oranje Lijn (1937-1967). Gross Tonnage: 1599 Main engine: 1800 APK. Speed: 12 knots. 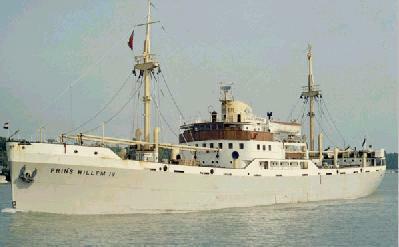 The Prins Willem IV had accommodation for 12 passengers. Overall length: 76 meters. Width: 13 meters. Gross tonnage: 1535. Main propulsion engine: Stork 5 cylinder motor, 1400 HP. Service speed: 12,5 knots. Crew: 30 Ship's international call sign: PGWE This ship is not very big. The length and the width were tuned to the locks which gave access to the Great Lakes in Canada and it would have fitted in the locks with not more then 10 or 20 cm to spare on each side. A coaster or a modern fishing ship has about the same length as the Prins Willem IV. May be you are wondering why the bridge was constructed - on this ships and most others in those days - out of wood instead of steel as the other decks were. This was done as to influence the magnetic compass as little as possible. Any steel near the magnetic compass would result in serious deviations from the real compass heading. The compass on top of the bridge deck, the so-called top deck, could be read in the wheelhouse via an ingenious periscope system. No gyro compasses were yet available then. 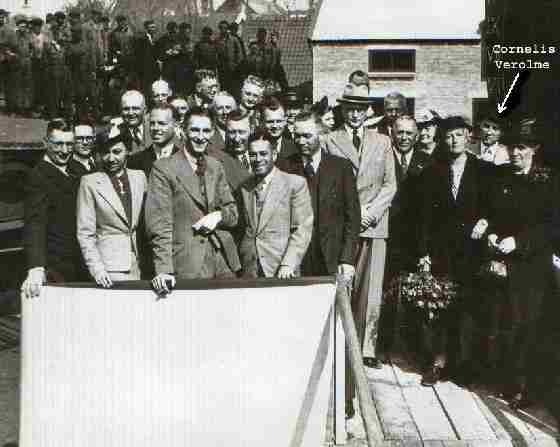 This picture was taken during the celebration of the first lustrum of the shipping company founded in 1937 by Anthony Veder who was in that year only 23 years. 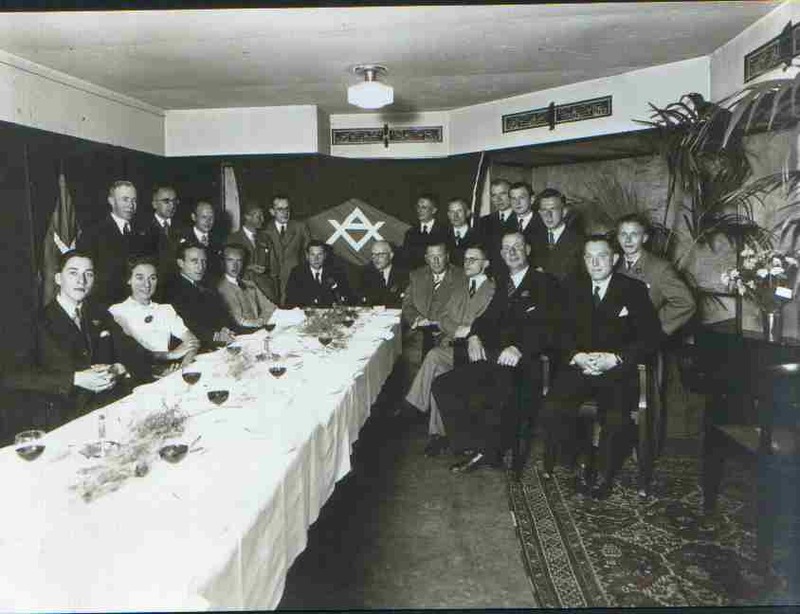 In the picture he is 28 and sitting at the table at the left. My aunt Corrie is sitting next to him and the only woman in the entire office. She worked until 1946, when she was expecting her first baby, in the office. Note : Sale was not effected. 1973 Renamed to Gilvani ? * Ketting, Herman: New build drawings of the Prins Willem IV and the relevant list of words.